» home » magazine » 2014 » january 2014 » "we put a press where we had no business doing so"
The LuK pressroom houses five transfer presses and six progressive-die presses, including a 125-metric-ton Bruderer press (bottom right) that turns out torque-converter blades at 400 strokes/min. 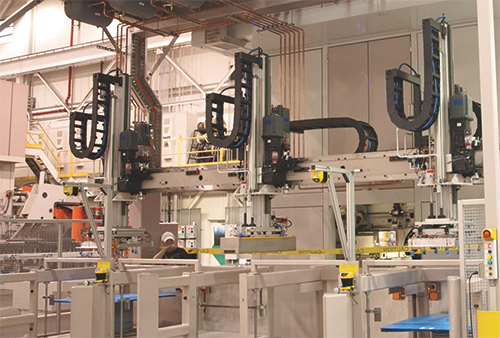 The newest addition to the pressroom is a 2900-metric-ton Schuler transfer press (right), which includes (shown) a four-station stacking system. Stamped parts will stack in the two center stations, and a robot will lay cardboard pieces, stacked on the two outer stations, onto the part stack as needed to protect the parts from damage. Torque-converter stamping and assembly is booming at the Schaeffler LuK USA manufacturing facility in Wooster, OH. The plant’s stamping capacity has been pushed to the limit thanks to rapidly growing order volumes. We’re talking 8000 torque converters/day assembled and shipped, and more than 900,000 stamped parts/day. Several new presses have been brought in to increase stamping capacity, and numerous lean initiatives have been enacted to help the company return to a five-day three-shift operation. All of that’s a breath of fresh air to Gray and others, having operated the plant around the clock, 24/7, for the last couple of years. A sense of urgency permeates the LuK pressroom, driven in part by holding press operators accountable for meeting established OEE goals. 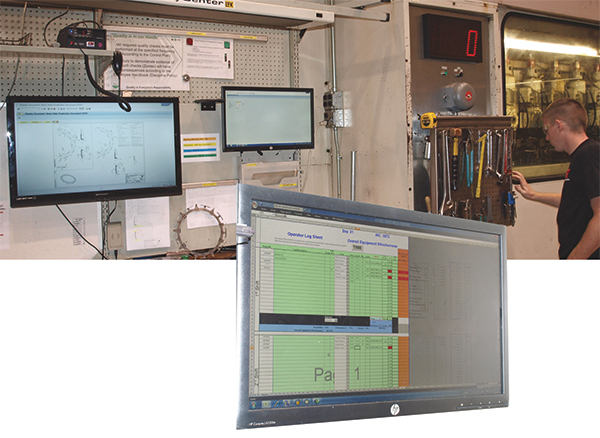 Each operator workstation includes monitors (left) where they can enter production data and track performance. And, to help operators quicken die changeovers, their tool cache (above) has been streamlined and neatly organized. The key is managing and optimizing overall equipment effectiveness (OEE) and driving capacity gains. The pressroom boasts five big transfer presses and six progressive-die presses. New additions include a 2900-metric-ton Schuler transfer press (not yet ready for prime time when we recently visited the plant), a 630-metric-ton Kaiser mechanical press and a 160-ton high-speed Minster. Progressive dies churn out stampings as thick as 7 mm, but more typically run 1-mm steel stock to stamp torque-converter blades, sheetmetal rivets and other small parts. This scenario is most typical of the lower-tonnage Minster and also on a 125-metric-ton high-speed Bruderer press “designed for speed,” says Gray. Rated to 800 strokes/min., the Bruderer turns out converter blades at 400 strokes/min., producing as many as three blades per hit. The new Kaiser press, meanwhile, makes the firm’s most tightly tolerance components, such as adjuster rings and sensor rings for clutches. These and other clutch components ship to a LuK assembly plant in Mexico. Sensor rings, stamped from 1.5-mm-thick steel, carry dimensional tolerances as tight as 0.1 mm. It’s the new Minster press that Gray’s team added to the plant, for capacity reasons early in 2012, which most recently received an efficiency upgrade. “We’re very close to achieving our OEE goal,” he says, “a significant upgrade from where we were just a couple of years ago.” He notes that of the pressroom’s 19.2 million stamped parts/month, some 4 million comes from the Minster and 12 million from the Bruderer. That’s a 25-percent improvement due, in large part, to an emphasis on achieving quicker die changes. You Want to Install the New Press Where? Progressive-die presses undergo an average of 90 changeovers/month, and until recently changeover time hovered around 40 min. That’s been whittled down to an average of 30 min., and as little as 24 min. 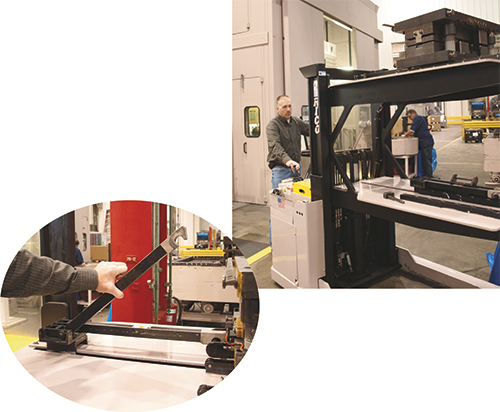 Gray demonstrates the tight turning radius of the Rico die cart, allowing it to access the firm’s new 160-ton Minster high-speed press (background). The cart is outfitted with a pair of hooked arms (left) that wrap around steel loops LuK bolted to 150 of its dies. LuK also uses the cart to changeover the Bruderer press, which has shaved at least 2 min. from its changeover times compared to using a tow motor. How, then, does the Minster press operator change-out his dies? “We went to die-cart manufacturer Rico Equipment (in nearby Medina, OH) to develop a custom solution for us,” Gray shares. 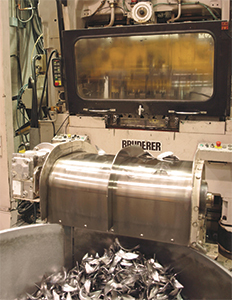 The resulting cart is a Rico Model R-DHFP-2T-60 two-tier 6000-lb.-capacity die handler outfitted with a pair of hooked arms that wrap around steel loops LuK bolted to some 150 of its dies. The cart features two horizontal tables on one carriage, allowing die transfer and storage to be performed in one docking operation. Rico literature notes that its die handlers are designed to operate in less area than conventional forklift trucks, due to their tight turning radius. This allows less space between presses and minimizes wasted aisle space. LuK not only employs the Rico die cart to perform die changes on the Minster press, but also uses the cart to changeover the Bruderer press, in place of a tow motor. The use of the die cart, and the need to carefully schedule its use so that it’s available when the Minster and Bruderer need it, is indicative of the overall sense of urgency evident in the LuK pressroom. Press operators are responsible for attaining established OEE goals. As such, LuK’s press operators have engineered several Kaizen events to help quicken the pace at which materials move through the shop. One example we spied: each press line includes a set of three signposts used to signal to the pressroom team the status of the line. Green signs indicate the presence in the press cell of the blanking and forming dies and coils needed for the next job scheduled to run; a red sign means something’s missing in order for the next job to run. As we toured the pressroom, all we saw were green signs—excellence in action. “This is just one of many action items initiated from ideas provided by our crew,” says Gray, “that add up to squeezing as much productivity and throughput we possibly can from our existing press capacity. See also: Schuler Incorporated, Nidec Minster Corporation, Bruderer Machinery, Inc.